Most of the people who learn English spend their life in an office. Therefore it is neccessary for them to learn the names of the equipment there. 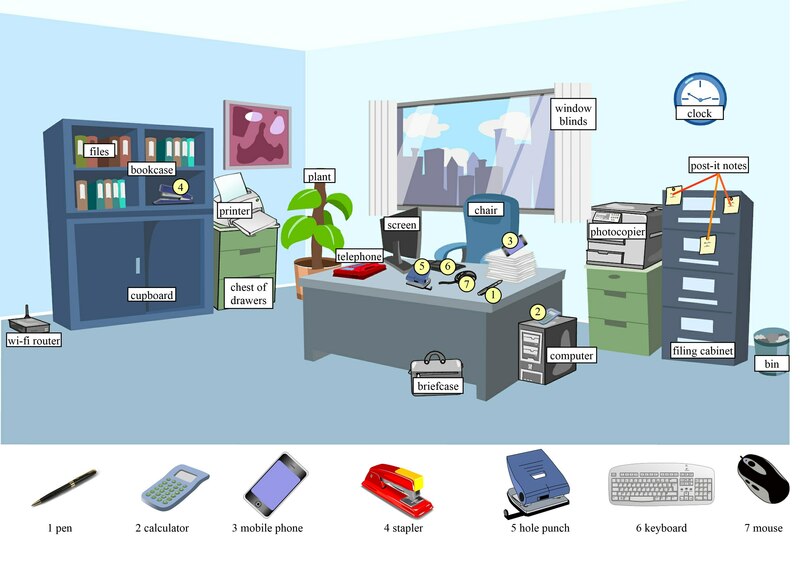 In this post I introduce 25 office vocabulary items in an infographic and a video. You can then practise all the words in interactive quizzes (over 70 quiz questions) and in a paper worksheet. Moreover, if you have your own blog, you can share the activities. The following infographic contains 25 vocabulary items. Students should first study the picture and try to remember the meaning of the words. The activities above are ideal to introduce the words and their meaning. However, to really learn the words, you have to use them and practise them. In the following quizzes you have to produce the words and thus there is a bigger chance that you will remember them. The first quiz is interactive and as it is in HTML 5, it will play on any mobile device. If you do not like doing quizzes on the screen, you can print out the following pdf files and use them instead. There are several tasks to practise all the words.